Well done!! I am so glad to see someone smoking and enjoying these fine cigars. Thanks for the great pictures and reviews. 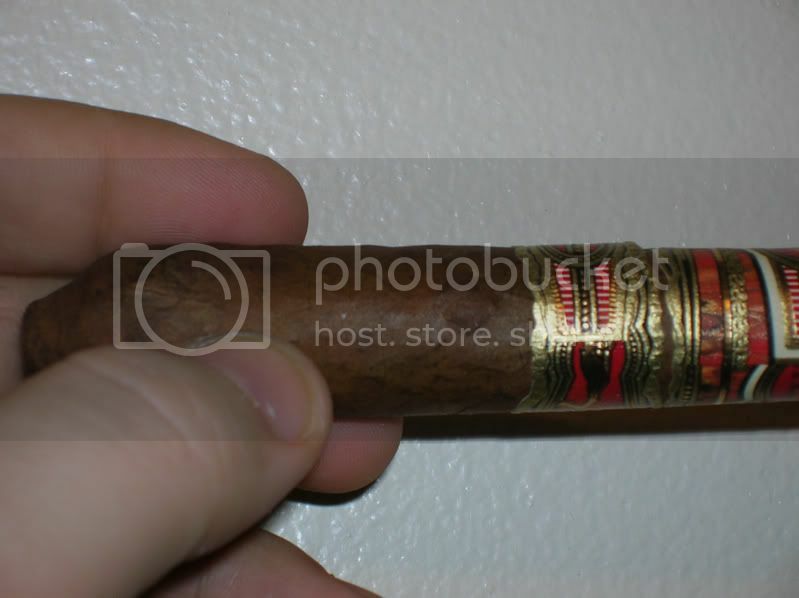 BTW, I didn't know there was a Casa Fuente Xikar - that is pretty sharp looking! I had checked on this thread for some time. Thanks for taking us on a great ride! Well done! Just got done reading your review and it was very informative and the pics were great! Thanks for taking the time to do it right. Well ladies and gents, I have found the review I had written about the X Square. So now we get to go back in time. Final stick of this long review project I started smoking the CFCF Opus X 22 Fun box as I like to call it. The first X Square I had was a dud. So I decided to smoke the 2nd one from the box. My initial smell out of the wrapper was of candied raspberries. This cigar is very potent and strong smelling. The complete opposite of the first one I had. Inspection of the cigar showed that I couldn't find a single problem with the wrapper or construction. I clipped the cigar at 9:09pm and poured about a finger worth of Laphroaig 30 year old Scotch. This glass was the final drink I would have after I smoked the cigar and complete the reviews I embarked on. I cheated after lighting the cigar and at 9:11pm I took a sip for all my fallen brothers and sisters that died during combat and toasted to the ones that had served and the ones still serving as today was Memorial Day. Nothing like smoking a rare Opus X and a nice glass of Scotch for them. I inhaled a puff at 9:13pm and got a slight raspberry taste off of it. Its a wonderful smell even after 2 1/2 years of age on it and I think this cigar has great promise. Considering I still think its young and not matured completely. Plenty of smoke off each puff and a easy draw. Definitely tell this is a Opus. Seems like a subtle hints of strength awaits and I made this observation at 9:17pm. It has a peppery smell to it at 9:18pm. It just took on a woody note at 9:19pm. The after taste reminds me of raspberries cooked in some wine which I can't identify just yet. But it is a nice taste so far. Just a pleasant after taste at 9:21. This could be Heaven right now. At 9:23pm the Opus qualities really opened up which was distracting. Just inspected the ash at 9:26pm and its really spotted nicely underneath the wrapper. I would say the oils have crystallized nicely on this cigar during its aging. At this time I decided the cigar needed to drop the ash I had on it. After ashing, the initial puff was a woody/raspberry characteristics. I guess its time to exhale through the nasal passage and see what the cigar tells me about it. I did this at 9:29pm and its still young from the impression I gathered. It really burns and brings tears to my eyes. The taste in the mouth was a musky/earthy taste with a side dish of raspberries. Just for a brief moment it reminded me of a nice coffee I've gotten before in Salt Lake City at the SLC Roasting. Its a great coffee house if you ever visit Salt Lake City just off 200 East 400 South. Touch up at 9:34pm and the first puff is showing signs of tar. Its still has a nice hint of raspberries at this point. Time to ash at 9:38pm. Also requires a minor touch up. At 9:42pm, it reminds me of Spanish cedar burning. Again at 9:47pm, the raspberry notes hit me once again. There hasn't been much going on with this cigar since 9:34pm. Time to ash at 9:48pm. So far the burn has been great with only a couple touch ups required. the cigar does seem to be picking up strength slowly. Now at 9:49pm, I picked up a creamy raspberry taste for a brief moment. The 2005 band was taken off at 9:58pm and then I ashed the cigar at 10:00pm. Not much has changed in this cigar so at 10:10pm, I ashed the cigar. Its pretty much stayed consistent with what I've already wrote up to this point in time. I took off the big Opus band at 10:14pm and still no changes. I ashed once again at 10:32pm and nothing remarkable to write anything about this cigar. I finally nubbed this cigar at 11:06pm and nothing changed for the last hour of this cigar. I was really disappointed in that fact but over all it was a good smoke. I'd given this a cigar of a 80 to 85 points out of a 100. Due the last hour it just seemed to stall out. I do think this cigar will be different over many years, but alas, I smoked both of them for this review so I will never find out if my impressions will come true. Ungodly thread here. Keep em' coming! I look forward to it. Kingantz's reviews may be the most comprehensive, but yours make me feel like I'm actually smoking the cigar. Lancero, BBMF Maduro, BBMF,Reserva d'Chateau x2, Rising X, El Scorpion x2, Perfecxion X x2, Perfecxion #2, Scorpio x2, Shark x3, LFMF x2, Chili Pepper, Love Affair x2, and Lancero. I haven't decided how the line up will go down but I'm wanting to smoke a Opus X pretty bad. This means one will probably get reviewed real soon. Stay tuned and hope this one will be better than the 2005 version. The line up has been selected. There is 13 different cigars to smoke from this box. If a dud happens and there is another one to smoke, I will revisit it and review it which will be done 2 weeks later. This will delay the finishing time of the review. Unfortunately there has been duds in the CFCF boxes. The plan is to review one every 2 weeks and I will be kicking it off this weekend. Between Friday to Sunday sometime, the first will fall. Now the best part is this will not interfere with my original plan of wanting to do a CFCF 2008, 2009 and the 2010 box review while out of the USA some where in a few years. 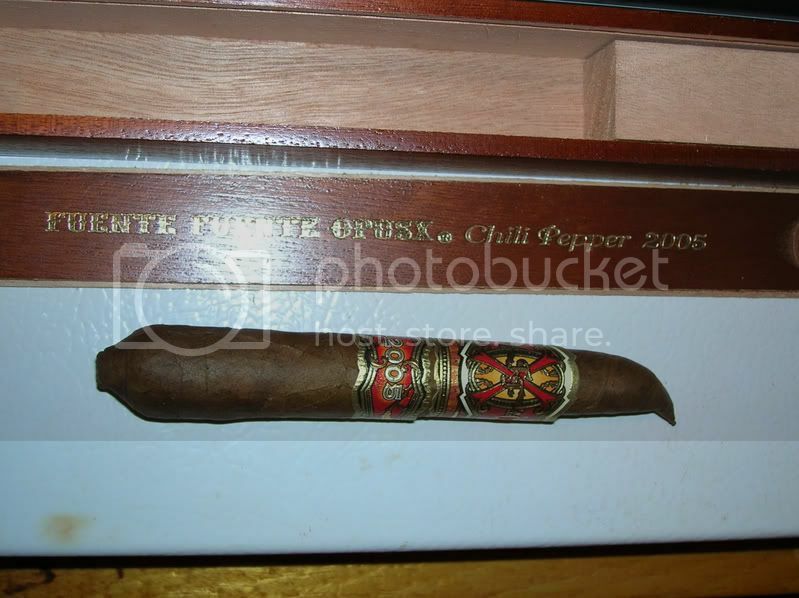 Here starts the CFCF 2009 Opux X reviews. Its going to be 1 every 2 weeks till the box is gone. Without further ado, here is the first one. Initial inspection I found several flaws in the wrapper. None that should effect the draw. I used my Casa Fuente Xikar I purchased back in Sept 2005 for this cut. I was able to clip off the cap without tearing the wrapper. Before lighting up, I can smell the candy raspberries smells off the wrapper. I fired up at 5:25pm down at the beach in Matagorda Bay. Definitely tastes like an Opus X. Pretty light and easy draw with plenty of smoke off each puff. Unfortunately there is a burn issue. A light peppery notes followed by a mild lemon grass taste as an after thought. This cigar took on a lemon pepper characteristics. A strange taste to come through the cigar which is in reference to the lemon taste. Part of the wrapper refused to burn on one side of the cigar. So a touch up was required on one side of the cigar. Hopefully the picture will capture the moment for all to see what I am talking about. I noticed an interesting channel that was in the filler and was the cause for the strange burn of the wrapper. The lemon pepper note is still there in the cigar. After I take a puff and exhale the smoke out, I feel like I want to chew as if I had just taken a bite of a Peppercorn Steak. Just when I thought the nasty channel was gone, it reappears once again. The burn wasn't as bad in this section of the channel. The draw is perfect and plenty of smoke comes out after each puff. My lips started to tingle from the nicotine buzz I was picking up off the wrapper. The VA put me on a nasal spray for allergies and a pills, so this cigar definitely took on a unusual taste for me. Since this is just a Reserva d'Chateau, I didn't do an in depth review. After all, it is a common stick. 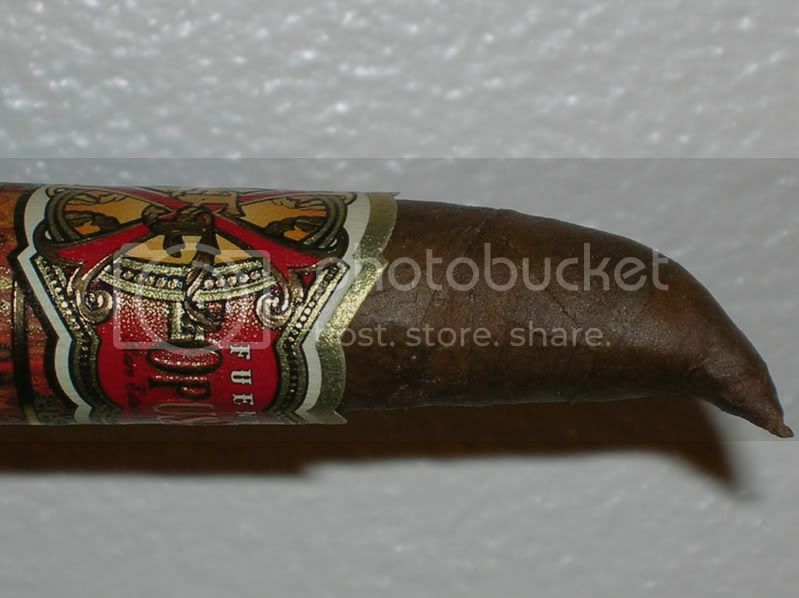 It was still a good cigar but it didn't take on the raspberry taste that I generally find in a Opus X. I will smoke the other Reserva d'Chateau at a later date to compare if this was just a fluke or is the same as the other one in the box. I did take the small band off at 6:09pm and the big band off at 6:18pm. The tastes stayed pretty consistent to what I already mentioned previously. I put the cigar with a little over an inch left at 6:35pm when I walked into my first American Legion meeting. I only took a couple of pictures of this since it is a common cigar. I will get them uploaded probably this Friday when its payday and I will visit the local coffee house to do it. Depending how things go, I will smoke the 2nd Cigar of the CFCF 2009 box this weekend. I'm having some pretty serious rare side effects of my new medicine and hopefully I will get to discuss it with my Doctor tomorrow. It will be the 2nd common cigar of the box so nothing to fancy just yet. Due to the current medical problems, this will be delayed a bit. i have 5 appointments at the VA Hospital between Oct 20th to Nov 4th. Plus a lot of antibiotics to take. If I am feeling better during the week, I may try to smoke the 2nd cigar of the Review. Wishing you smooth sailing and a speedy recovery bro. The wrapper is in perfect condition. No tears nor any soft spots in the cigar. I cut and fired the cigar up at 2:44pm. The initial taste on the wrapper has a light candied raspberry taste. The draw is great and plenty of smoke off each puff. There is a hint of a peppery characteristic to this cigar. I have some Russian music playing as I type this up while smoking the cigar. I decided to do this review a little different. The smoke also has a light raspberry quality to it. The burn is pretty good and hopefully no touch ups will be required. I should note that all these cigars from the CFCF 2009 box have been out of the coffins since June/July 2010. The ash reminds me of the Pillsbury Flake Biscuits you can pick up at the grocery store. The smoke has a semi-sweet smell to it with a little side dish of white pepper on the tongue and nose. Only a couple of pictures since this is a common cigar. I did a little touch up on this fire cracker at 2:55pm. The first 1/2" of the ash is darker while the first 1" in has a whitish color to it. The tongue is starting to tingle a little at noted this at 2:56pm in which I also ashed the cigar for the first time. There is an after taste but its hard to describe so far. The smoke isn't chewy and when exhaled out of the nasal passage it has a young taste to it. It didn't bring tears to the eye when exhaling the smoke out of the nose. My tip of my tongue is where it tingles. The smoke still has a semi-sweet and peppery notes at 3pm. A mild correction of the burn at 3:01pm. Ok..scratch the semi-sweet smell at 3:02pm and I can tell this has something going on on the back side. But it lingers just a little. Now I wished I had some more common Opus X so I can compare those experiences to this one. There is still a hint of a raspberry smell in the smoke and its time to ash again at 3:04pm. I think I got a little hint of spanish cedar and a very slight smell of alcohol in the smoke at 3:05pm. But it definitely doesn't have that taste when I take a puff on the cigar. Another little correction of the cigar at 3:06pm and ashed a little. The cherry of the cigar comes to a point as well. I hope it would burn a little more even, but oh well. It is made by a man/woman after all. I've approached about the middle of the cigar and it still has a slight peppery notes to it. Not a bad cigar so far. A mild channel just made an appearance in the cigar. Well, I should say so far a little pocket and it seems like its past it now. I just smelled the smoke and it had a hint of raspberries at 3:11pm. The tip of the tongue still has a tingle going on. I can't say this cigar is overly spicy as it isn't but it definitely has a raspberry, white pepper characteristics I have now picked up since the VA Hospital put me on a sinus spray and allergy pill. Again, something underlying is going on that I can't really identify too. As most of my Opus X experience was when my sinuses was plugged. This is kinda irritating me since I can't identify it with my previous experiences. The burn has gotten much better and I can say its pretty even since it past the little empty pocket in the filler. The ash is still whitish in nature and I would consider smoking this cigar after a nice hearty meal. I should have smoked this after taking my brother and sis-n-law to the seafood place. The smoke has the candied raspberry/pepper smell to it once again at 3:16pm. I can tell a little nicotine buzz is starting to kick in. A little touch up required since another small empty pocket showed up. Nothing major either like some cigars can have a channel over 4" like the Monte A I had this week. I just ashed at 3:18pm and the burn is even once again. I'm going to need to take the 2009 band off pretty soon. The impression I noted just above at 3:16pm made an appearance once again at 3:19pm. This is when I slid the 2009 band off without tearing it. There wasn't the Fuente super glue under this band as I call it. Definitely a perfect day to smoke this cigar since its only 72 degrees out. The little patio is surrounded on all 4 sides so the wind isn't a factor and I love this. Its a big plus while reviewing these cigars. The cigar still has the same taste I noted between 3:16 to present at 3:23pm. The cigar is smoking pretty cool so far and I have less than 3" to go. Again, plenty of smoke off each puff and the burn is now completely even. The ash has started taking on a slight black look in the ash. The smoke has definitely kicked up a notch or two since 3:16pm. I guess I will have a nice nicotine buzz by the time I finish this cigar off. Wowza...the smoke just took my breath away for a second at 3:26pm. Yep...here comes the buzz. 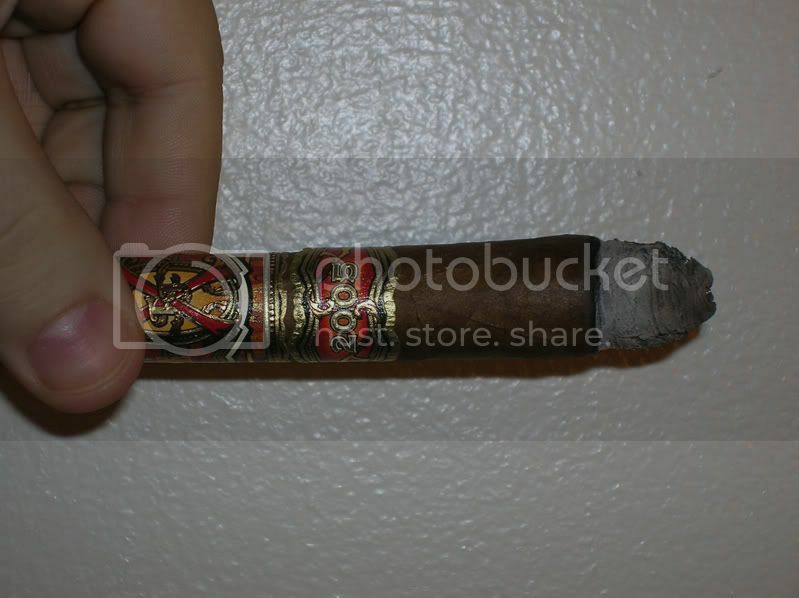 :laugh: The cigar has definitely getting a little warm under the Opus X band. I just ashed at 3;27pm. The burn is completely even and will hopefully stay that way to the end. A small 1/8th of an inch crack appeared just below the cherry of the cigar and shouldn't hurt the burn at all. I just exhaled some smoke out of the nasal passage at 3:28pm and the strength of the cigar has picked up like a snowball down a mountain side since the buzz is really making an appearance. The raspberry characteristic really isn't present in the smoke any more. But there is once again a semi-sweet smell to it. I should say its pretty light and one would miss it if they didn't smell the smoke after blowing it out of the mouth. About a 1/4" till the Opus X band needs to come off. The peppery notes has made another appearance at 3:31pm. WOW!!! Ok...the smoke makes me cough when I inhale some of it. The big band slid off at 3:33pm and the cigar has definitely gotten a little warm with each puff. This is when I ashed the cigar once again. 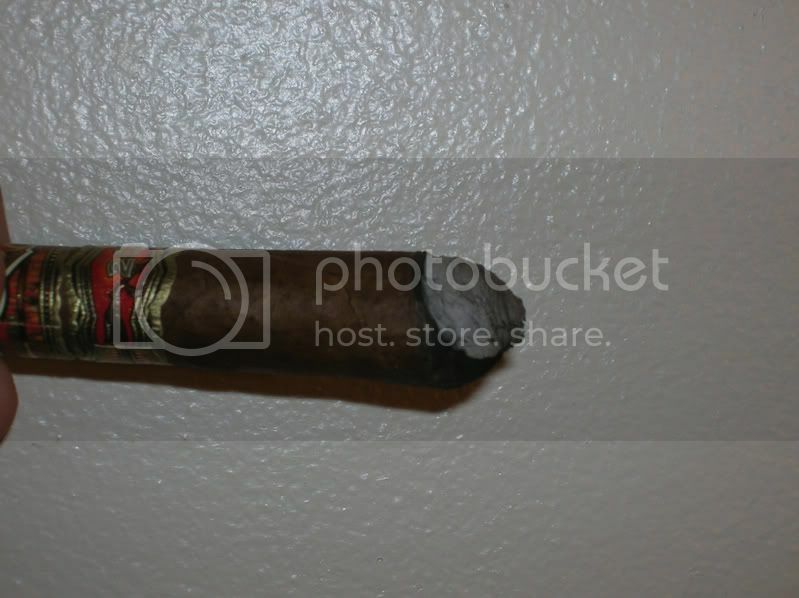 Unfortunately the cigar developed a crack underneath the big band. I don't expect it will effect the burn at all. I did take a picture of it with the bands off. The smoke has now reached the phase where its potent. The lips have now taken on a slight tingle with the tip of the tongue. 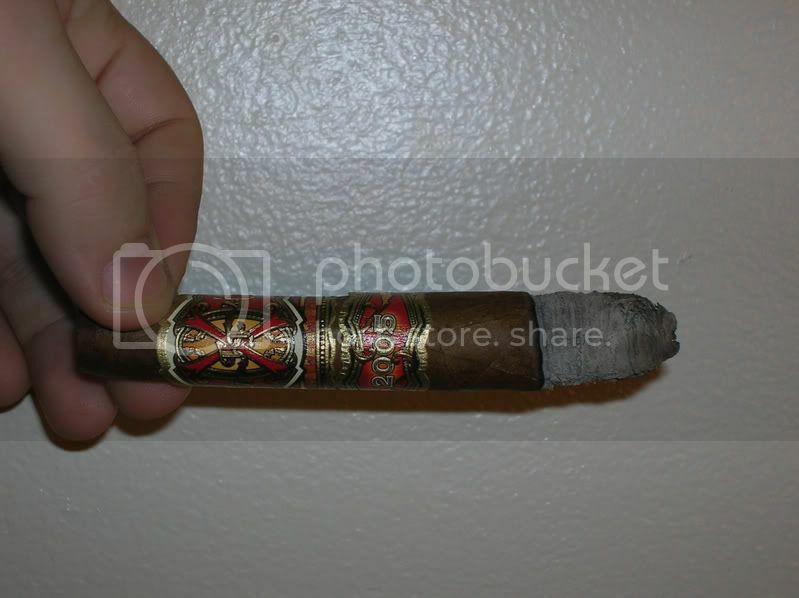 The cigar isn't like a roller coaster ride on the taste buds like other Opus X I have smoked. Its pretty consistent in how it smokes, burns and tastes. The crack has gotten bigger and it hasn't effected the performance of the cigar yet. I have like 1 1/2" left to go and no idea if I can nub it. I just ashed it again at 3:40pm. The crack in the wrapper is about to get burnt up which will be nice since its easier to ash when I don't have to be extremely careful with it. The smoke has gotten a little warm in the mouth at this time. I wished I could define the underlying after taste i get off this cigar since it would put my mind at ease. The crack has now developed towards where the cut is at. I guess the cigar is pretty much done at this point. The taste isn't changing now other than the strength is picking up as it gets closer to the cut. 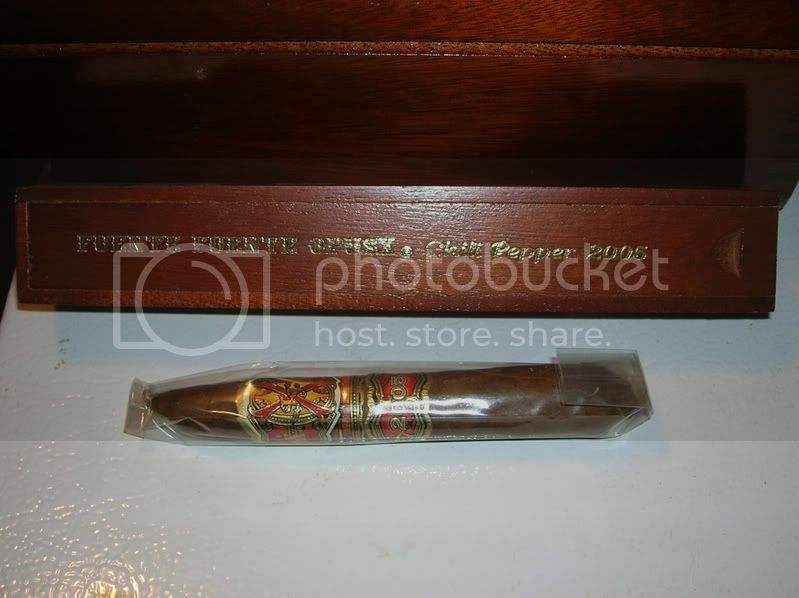 The tarry taste hasn't made an appearance either like some of the Opus X that is in this CFCF box. I'm noting this from my previous experience of this box. The cigar smoke has made the impression of it could be a little over bearing if smoked in a car. Well, near the end of the cigar. I just inhaled some smoke at 3:46pm and I start to cough up a lung. LOL!!! About to toss the cigar at 3:50pm. I'd give this cigar a solid 90 points out of a 100 point scale. Ok...I hope to be picking this back up this week sometime. I finished the 2 weeks of 2 different antibiotics and my taste buds seem to be back. Still trying to locate my USB/SD card adapter which got put some where during the last move. Pictures still delayed till I find that little bad boy. Not that I took many pictures of the common cigars but definitely want it for the rest of the line up. Your review was very informative and concise , I have smoked this set and found it to be one of the best purchases I ever made. Thank you!